SMS marketing is a strategy based on sending SMS to a broad audience around the world. SMS marketing is efficient for all kind of businesses because it helps reach different goals within a short period. Global reach. As five billion people have a mobile connection, SMS marketing offers vast opportunities for engaging with the audience, limited only by creativity and the size of the phone number list. High level of interaction. People check mobile phone 80 times a day, for that SMS marketing campaign shows significant open rate. Multiple opportunities for usage. Businesses use SMS marketing for advertising, alerts, notifications, reminders, password confirmations, competitions, news, product information, etc. Fits business of all sizes. Huge companies like banks, travel agencies, airlines, healthcare providers, etc., take advantage of SMS marketing as a tool to reach masses, while small business uses it for local audiences with more precise aims on a smaller scale. Instant contact with users. 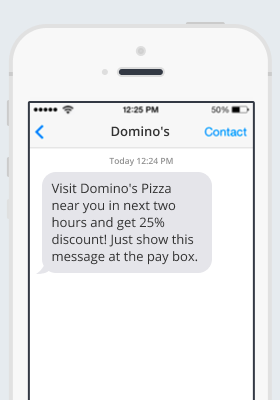 Typically, an SMS campaign takes 3-6 seconds for the delivery. The speed is an essential factor of SMS marketing efficiency. No bounces. Unlike email marketing, there are no bounces during SMS marketing campaigns. Even if a mobile device is out of range or turned off, the SMS will reach the users after the phone is connected to a mobile network again. Works best in combination with other channels. SMS marketing goes along with email marketing and web push notifications. Savvy marketers create a mix of these channels to reach their goals, and sometimes they send SMS automatically to duplicate the message that email failed to deliver. No special skills required. Creating SMS campaigns is very easy. It takes about five minutes to build one. Location. Prices vary depending on the country you send SMS to. Channel. The cost depends on whether you send SMS to your native or foreign country. It is called the national or international channels, accordingly. Sender’s name. The laws of some countries require registration of the sender’s name. Unregistered sender’s name allows only 11 symbols. 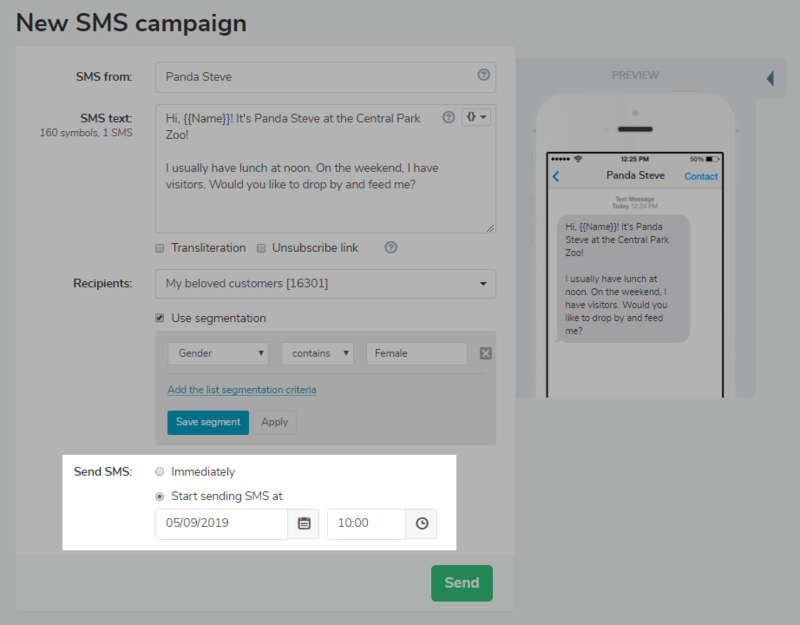 SendPulse allows sending SMS campaigns at the speed of 200–500 SMS per second on 800 networks in over 200 countries around the globe. Learn the prices for SMS marketing and compare them with other services. 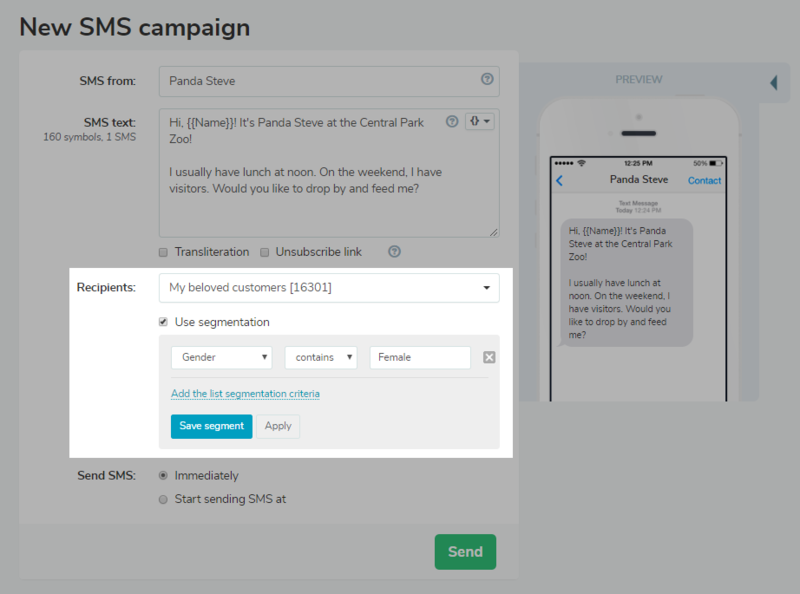 You can start SMS marketing in SendPulse after the registration. Use the “Send SMS” icon on any page in the right upper corner in the website’s header. It can be up to eleven characters long including spaces. Only Latin letters allowed. The length of one SMS is 160 symbols. Personalize a message using variables. Different subscribers will receive slightly different SMS, based on personal data like name, gender, country, etc. You can see how your SMS advertising looks like on a mobile phone, previewing it on the right-hand side. Select one of your mailing lists or type in one number per line manually. Enter recipients’ phone numbers in the international format. Use segmentation to tailor messages to more specific groups of people. You can send the message immediately or schedule it for the most convenient time and date. Here’s a more detailed instruction on how to do SMS advertising. 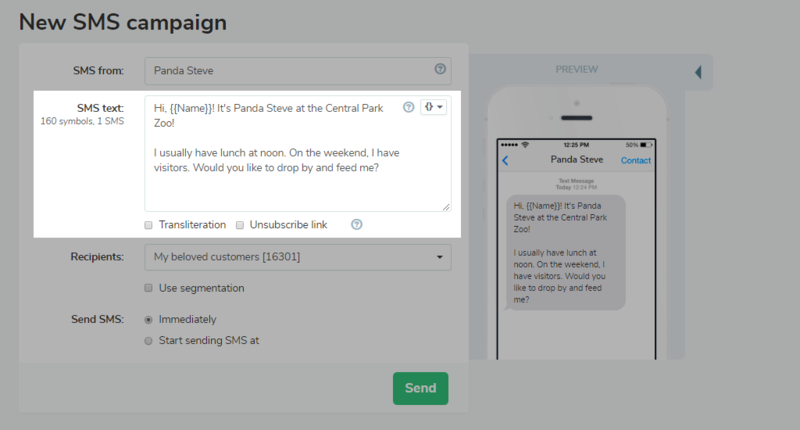 SendPulse enables you to use SMS marketing as an integrated part of your automation. You can send SMS to those users, who have never opened an email, and duplicate the information in the SMS, which is more likely to be opened. 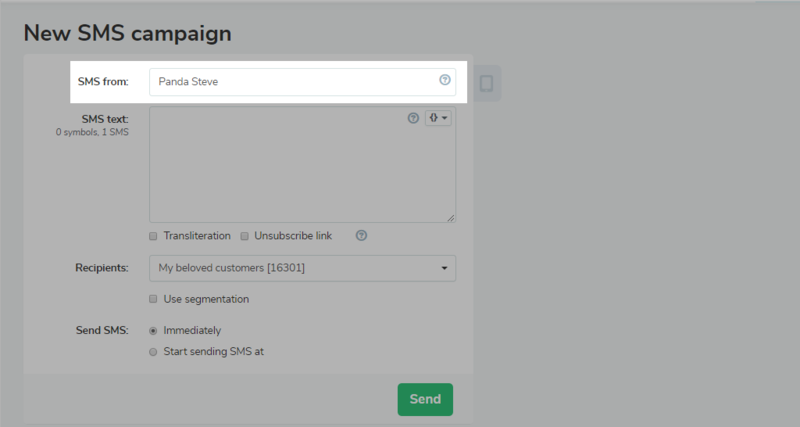 You can also create an automation flow which consists of SMS only. Here’s an example of how it might look. Opt-in phone contacts. Don’t send SMS campaign without recipients’ permission. It’ll do your business more harm than good because if people don’t expect messages from you, it will only irritate them. Make time-sensitive offers. Add the element of urgency mixed with a unique value. It’s a strong incentive to engage customers with your proposal. Implement personalization. 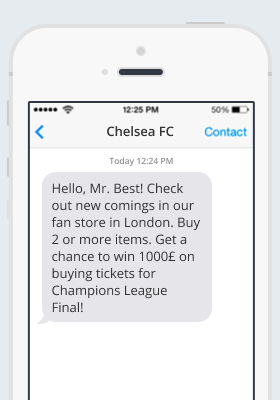 Personalize your SMS marketing to provide your audience with a more pleasant experience. Personalization is a key for building trustful relationships with the customers. Write a creative text. The length of the SMS is 160 symbols. You have to be flexible to promote your product and intrigue the consumers. Be as short as possible, using every word to the point. Segment your audience. With segmentation, you can send slightly different messages to various groups of people based on similarities like gender, country, place is sales funnel, etc. Send SMS when convenient for users. Find out the best time to send an SMS campaign to reach more audiences. Do not interrupt people when they are most probably busy or asleep. SMS marketing is a tool for multiple purposes. Let’s find out how businesses use it to fulfill their needs. Restaurants. SMS marketing is a crucial instrument to grow loyalty among the customers by giving discounts from time to time. Sport clubs. Businesses as such can announce games, confirm the booking, make competitions for the fans, offer discounts on merchandise. Airlines. 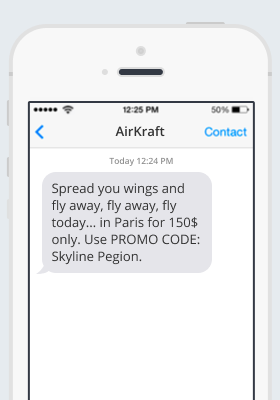 SMS marketing is useful for sending reminders about the flights, proposals on tickets, updates on new destinations, etc. Also searched with "SMS marketing"
Rate this article about "SMS marketing"
If you are interested in "SMS marketing" you might be interested in our bulk email service.